VALLEY CENTER, CA--(Marketwire - September 21, 2010) - National Animal Supplement Council (NASC) announces a buyer beware to people purchasing animal health supplements with misleading quality assurance claims. The warning contains five fact-checks to inquire of supplement suppliers to verify credibility and substance behind so-called quality seals. The buyer beware is being issued in response to the growing popularity of animal health supplements and recent confusion in the marketplace over marketing-geared quality seals for products. "It's imperative that as an industry we continue to act responsibly at every level," says Bill Bookout, president of NASC, the nonprofit industry trade association leading the charge for national regulation of supplements for companion animals and horses. "The integrity and future of the animal health supplement industry is dependent on companies disclosing credible, non-biased, verified third-party information about their products and implementing programs to help ensure quality verification and continued vigilance." Quality seals should be awarded by unbiased, third-party organizations, not companies, retailers or manufacturers. Quality seals should require companies to adhere to proper labeling guidelines including warnings and caution statements suggested by the Food and Drug Administration, Center for Veterinary Medicine and Associations recommending regulatory policy. Quality seals should require product registration in the NASC National Adverse Event Reporting System, the most comprehensive and transparent system accessible to regulators with analysis of more than 1,400 unique ingredients and more than 5,000 individual products. Quality seals should require the company have a quality control manual with written standard operating procedures for production process controls to ensure a consistent and quality product. Quality seals should not be available for purchase, but must require suppliers to pay for an independent audit and random testing on ingredient potency, identification and quality. NASC is the first organization to initiate a third-party quality assurance program for the animal health supplement industry with its NASC Quality Seal Program. Since 2002, NASC has been the leader in educating consumers, veterinarians and business partners about credible animal supplement products and companies that have successfully completed facility audits of specific, nationally recognized standards through the Quality Seal Program. Companies that have been awarded the NASC Quality Seal include: 21st Century Healthcare, 4Ever Health Distribution, AHC Products, Animal Care Therapies, Animal Essentials, Animal Health Science, Arenus, Ark Naturals, Bomac Vets Plus, Cherry Capital Services, Coastside Bio Resources, Direct Action Company, Equilite, Farnam Companies (Sure Nutrition, Vita Flex and EquiCare), Finish Line, FoodScience Corporation (Vetri-Science Laboratories, U.S. Animal Nutritionals and Pet Naturals of Vermont), Foxden Equine, General Nutrition Centers (GNC), Genesis Ltd., Grand Meadows Nutritional Products, Greendog Naturals (Rainbow Light), Halstrum, Hartz Mountain Corporation, Herbsmith, Hilton Herbs Ltd., HorseTech, Hyalogic, In Clover, John Ewing Company, Kinetic Technologies, Manna Pro Corporation, Med Vet Pharmaceuticals, Natures Organic Pet, NaturVet (The Garmon Corporation), Nutri-Vet, Only Natural Pet Store, Overby Farm, Peak Performance Nutrients, Platinum Performance, Prime Performance Nutrition, Response Products, Richdel, Ridley, Rx Vitamins, SaluTech Industries, Sergeant's Pet Care Products, Sher-Mar Enterprises, Silver Lining Herbal Supplements, SmartPak, Sogeval Laboratories, SOURCE, Teva Animal Health, Thorne Research, Uckele Health & Nutrition, United Pet Group, Van Beek Natural Science, Veterinarian's Best, Virbac Animal Health, W.F. Young, Winners Bee Pollen Co. and Worldwide Nutraceuticals. 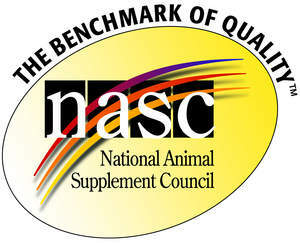 For more information about the NASC Quality Seal visit: www.animalsupplements.org. National Animal Supplement Council (NASC) is the first organization to initiate a third-party quality assurance program for the animal health supplement industry with its NASC Quality Seal Program.